As I am driving to my office my personal assistant calls me and informs me of something she thought would make me smile. This has less to do with business and more with the global power shift from West to East. 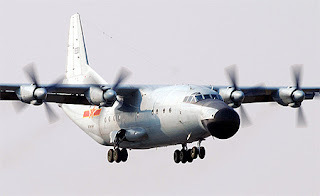 It involves a Chinese Y-8 airborne early warning system flew in international airspace by Japan’s southern islands and out over the Pacific Ocean. This was the first time a Chinese military aircraft conducted this flight. The Chinese Y-8 took the exact same path back into Chinese airspace and did not violate the Japanese airspace. Japan scrambled fighter jets in response to the Chinese flyby and Japan’s Defense Minister Itsunori Onodera stated that this is a sign of desire for further maritime expansion by China. Relations between Japan and China have been are not good and tension between both countries have surged over a dispute of the Diaoyu islets. The Diaoyu islets are inhabited, but offer very fertile fishing grounds as well as potential oil and gas deposits around the islets. Japan decided to increase tensions as Tokyo mayor initiated a plan to purchase and develop three of the islets which it purchased from a private Japanese owner. China claims that the islets are in its territorial waters and since tensions escalated patrol boats as well as military aircraft from Japan and China have circled the islets. The biggest threat comes from accidental collisions which would be used to further escalate the situation. This conflict reminds of the Cold War between the U.S. and the Soviet Union. Once again a financially weak economy is pegged against a financial powerhouse and emerging super power. Japan does not stand a chance to win a battle on any front, but their imperialistic patriotism blinds them which means the Japanese economy will bleed assets on a conflict it can’t afford which is exactly what China speculates on. I thank my personal assistant for this update and yes I do side with China here. They aim to operate the biggest capitalistic inspired economy together with Russia. Personally I neither care nor wish to get involved with how both countries manage their citizens, I care about how they manage the economy and they both excel and continue to improve. Unlike their moronic counterparts in the U.S. and EU, both countries understand that sustainable economic growth is vital, a budget surplus necessary and a socialistic approach to the economy devastating. The U.S. made it a mandate to devastate its finances hoping their image from the past will suffice in order to service the debt and get preferential treatment from its creditors. This is a stupid mistake which will rip the country into pieces and crush the entire American empire. China continues to grow economically, financially and militarily and naturally they seek to expand their influence and display their military strength at the same time. Japan can scramble all the jets it wants, the U.S. scrambled its jets whenever Russian super-sonic bombers approached their airspace which is nothing more than a dog barking and as we know a dog who barks does not bite.